Julia McMorrow was awarded a NERC Knowledge Exchange Fellowship. The associated project is Knowledge for Wildfire; improving management of UK wildfire through knowledge exchange. A series of four FIRES seminars and workshops on the effects of moorland and heathland wildfires and prescribed fires on ecosystem services were held during 2008-2009. The first seminar took place in Edinburgh 31 March – 1 April 2008. The second and third seminars were held in Manchester on 24 June 2008 and 31 March - 1 April 2009. Seminar four was held in the Peak District 13 – 14 May 2009. 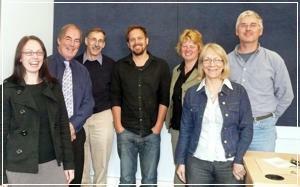 FIRES steering group meeting, Edinburgh, August 2009: from left to right Claire Quinn (Univ of Leeds), Jonathan Aylen (MBS UoM), Colin Legg (Univ of Edin), Jon Walker (Moors for the Future Partnership), Marion Thomson (The Heather Trust), Julia McMorrow (UoM), Klaus Hubacek (Univ of Leeds). Members not present were Simon Thorp (The Heather Trust) and Mark Jones (Chief Fire Officers’Association). The four seminars created a vibrant cross-sector multidisciplinary forum. Practitioners comprised more than half the audience. The series brought together over 130 researchers, moorland management agencies, policy-makers, Fire and Rescue Service officers, land managers and other stakeholders. It was the first time the Fire Service had been involved in coordinated academic debate on UK wildfires. A four-page Policy Brief and a 19-page report for Scottish Natural Heritage are available to download. Other outputs can be found on the Downloads page. An online survey of opinion on the Policy Brief recommendations ran until 15 October 2010. Results will be available soon (see News item on this page). FIRES raised awareness of the UK wildfire issue, its relationship to prescribed burning and its significance for ecosystem services. A clear need for further interdisciplinary research and knowledge exchange has been demonstrated. Gina Cavan/Anna Gilchrist, University of Manchester. Coordinated by: University of Manchester.